"We wish to congratulate and to thank President Donald Trump, Secretary of State Mike Pompeo, and the entire Trump administration for the recent appointment of Mr. Elan S. Carr to the position of State Department Special Envoy to Monitor and Combat Anti-Semitism. Anti-Semitism ranks among the oldest, most destructive forms of bigotry," the advertisement says. "It is a scourge that has plagued mankind. From the Nazi regime's genocide of six million Jews to the October 27, 2018 Pittsburgh synagogue shooting that claimed the lives of eleven Shabbat worshipers, anti-Semitism is responsible for a multitude of history's most heinous atrocities," it continues. 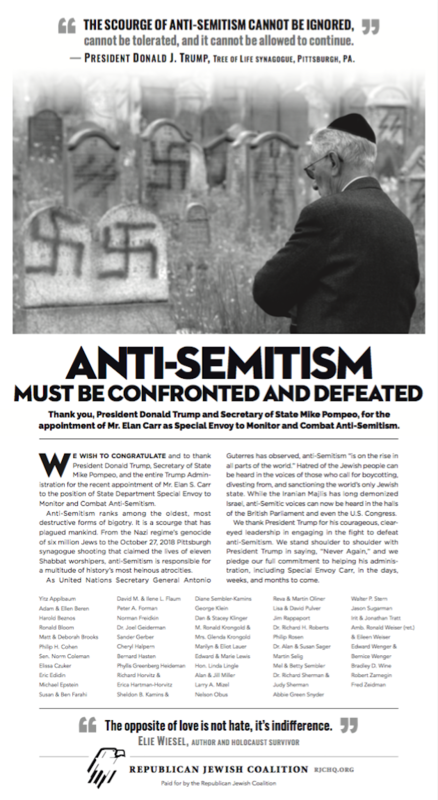 "As United Nations Secretary General Antonio Guterres has observed, anti-Semitism ‘is on the rise in all parts of the world,'" the ad states. "Hatred of the Jewish people can be heard in the voices of those who call for boycotting, divesting from, and sanctioning the world's only Jewish state." "While the Iranian Majlis has long demonized Israel, anti-Semitic voices can now be heard in the halls of the British Parliament and even the U.S. Congress," the ad states. "We thank President Trump for his courageous, clear eyed leadership in engaging in the fight to defeat anti-Semitism. 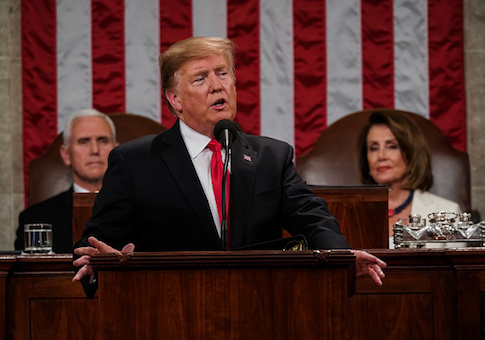 We stand shoulder to shoulder with President Trump in saying, ‘Never Again,' and we pledge our full commitment to helping his administration, including Special Envoy Carr, in the days, weeks, and months to come." This entry was posted in Issues and tagged Donald Trump. Bookmark the permalink.